Gut And Psychology Syndrome by Dr Campbell-McBride is an essential read for any person with a GAPS condition. It is a self-help book and will take you through the treatment protocol step-by-step. It will provide you with the full guidance through the GAPS diet with essential recipes. The book is also available in many language of the world, which you will find on the Where to buy the book page. Put Your Heart In Your Mouth is another book by Dr Campbell-McBride which will explain how heart disease develops and how to prevent and even reverse it with correct diet. It will give you full understanding of all the truths and myths about cholesterol and animal fats and their role in health and illness. You can get it from the same sources as the GAPS book. The GAPS Stories book will present you with 52 testimonies from people all over the world who healed themselves and their children from a long list of diseases using the GAPS Nutritional Protocol. These stories will give you inspiration and more understanding about your own illness, and can help you on your healing journey. A number of people who wrote their stories in this book have provided their contact details for those of you who needs more advice and help. You can get it from the same sources as the GAPS book. This two disc set provides over two hours of detailed advice, menus, and tips on making delicious dishes for every course of a meal from breakfast to supper. It will take you through the GAPS Introduction Diet step by step, stage after stage. It has been professionally filmed and produced in high resolution video and is an excellent compliment to the Gut & Psychology Syndrome book. 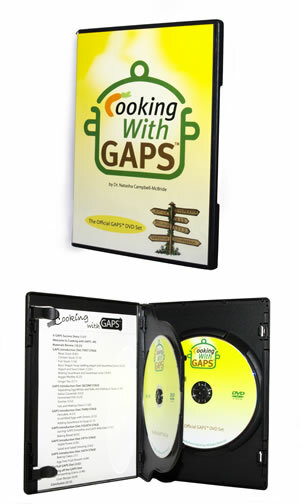 Dr Natasha Campbell-McBride has been involved in the entire production of this outstanding DVD set and it is the only video course on cooking with GAPS that is fully endorsed by her. It is available from all our book distributors in the UK, USA, Canada, Australia, and New Zealand and is also listed on Amazon in all those countries. I warmly recommend a new excellent cooking book by Nicole Azzopardi The Alchemy Cookbook. It has Nicole's story of illness and recovery in her family. It has wonderful beautifully illustrated recipes. I particularly like her fermentation recipes: so simple to make and delicious. She uses cocoa in some of her recipes. Make sure that you are ready for this step, as cocoa is not allowed on the GAPS Diet. My GAPS Diet Cookbook - by Pamela Jenkins & Donna Gates . GAPS has become a global phenomenon because the numbers of people all over the world who need this very specialised help is growing. Would you like to become a Certified GAPS Practitioner? If you already have a qualification to work with people in guiding them on their healing journey we will welcome you to our Online Certified GAPS Practitioner Course. You will be trained in how to implement the GAPS Nutritional Protocol and how to work with GAPS clients. Find out more about the Certified GAPS Practitioner course. Would you like to learn how to cook GAPS-style? Monica Corrado is a very experienced Teaching Chef running GAPS cooking courses. She is an Honorary Board Member of WAPF, her website is www.simplybeingwell.com. Her cooking courses are wonderfully interactive and very popular. Part 1: meat stock and bone broth. Part 4: Nuts, seeds, beans and grains. There are a few and the number of them is growing. Please search Google under GAPS and Gut And Psychology Syndrome. Look locally for organic farms and people who grow food in their own private gardens. A recipe book in French language by Denise Kruger Fantoli Guide et recettes pour manger GAPS https://www.nutrition-holistique.ch/recettesgaps.html Denise is very experienced in GAPS, she is a Certified GAPS Practitioner in Switzerland. The book gives a good description of The GAPS Diet with recipes and beautiful illustrations.